Squeeze in time for jubilation. Hi Shadow. I’m not sure why you gave me a mention, but I appreciate it. Seems good that you have a place where you can be completely honest. Your blog is very honest and open. How long have you been blogging? I had to enlarge my screen to 130% to read your list. Looks pretty much like mine, except ‘gardenting’ and ‘car wash’. Aren’t you adventurous! Ha! I really didn’t intend for it to be anything more than a picture, but, okay. . . and the real list was too long to capture in my iphone snapshot! Hehe. I figured that. Just being my usual difficult self. 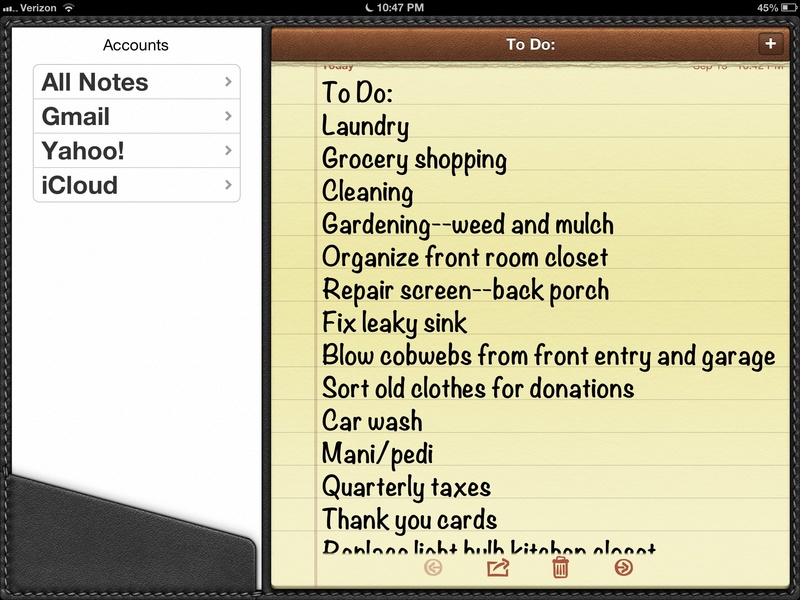 I use that Notes tool for my lists, too. I’ve been slowly marking off the items on my list, taking care of the obligations, hoping for time for the things that touch my heart and soul. A perfect poem to express my feelings, Joan – thank you. Well, Shari, when you work until 1 in the morning, you get more done than the average human.And that’s after a full day of work and an evening talking books with us-all. Tonight I go to bed earlier!